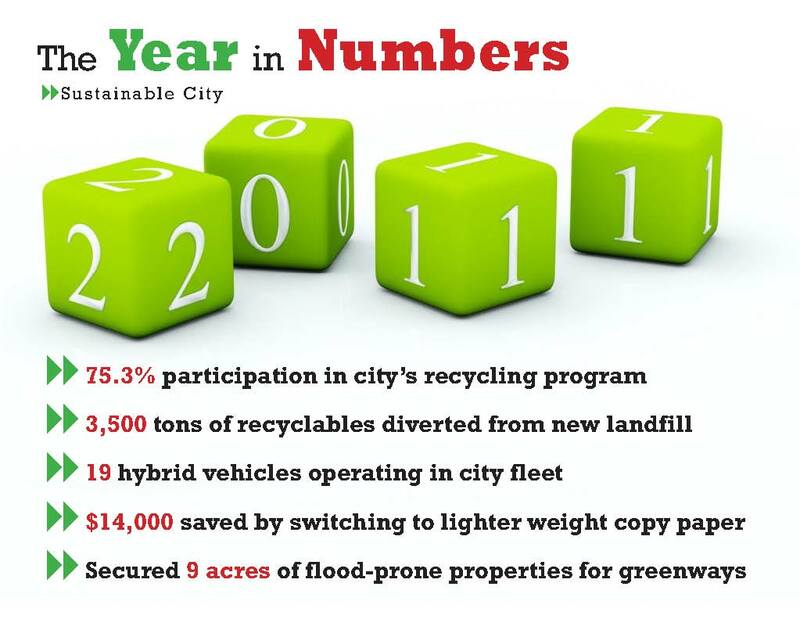 This is the final post of a six-part series by City Manager David Neeley based on his 2011 State of the City Report. After several years of using a council-appointed task force to assist the city with its sustainability efforts, it was determined that a different approach would need to be taken to complete the Green College Station Action Plan prior to the conclusion of the Department of Energy grant we received in 2009. The Action Plan, which will address energy efficiency, renewable energy, air quality, water conservation, protection of green areas and green house gas emission reduction as it pertains to the city organization, will be presented to the council for approval in 2012. Using Department of Energy stimulus grant funding, Parks and Recreation was able to complete the installation of irrigation system upgrades and smart controllers as well as LED parking lot lighting and solar-powered trash compactors at Veteran’s Park and Central Park. Several pilot projects were also undertaken to reduce costs and promote conservation, including the use of nitrogen in vehicular tires, synthetic motor oil, retreaded tires on certain equipment and a lighter weight copy paper city wide. Federal grant funding was used to leverage a $10,000 State Energy Conservation Office grant that allowed us to purchase two new hybrids that were integrated into the city fleet, bringing our total to 21 hybrid vehicles. The same grant was also used to provide mechanical training to fleet staff to maintain and repair those vehicles. Additionally, staff repurposed grant funding intended for the rainwater harvesting project and combined it with surplus funds to help purchase a new hybrid sanitation truck for Public Works, which is estimated to have a payback of less than five years. While the new Twin Oaks Landfill meant closing the book on the Rock Prairie Road facility that operated for 30 years, a gas purchase agreement passed by both cities and BVSWMA means the facility has an opportunity to use landfill gas for producing cost efficient and environmentally-friendly electricity on the site well into the future. In addition to the numerous programs offered to College Station residents — such as green seminars that focus on recycling, electric, sustainability, water, household hazardous waste, litter, composting and green gifting — the city also participated in with 92 code and building professionals for a series of energy conservation workshops. By securing a grant from the Texas Workforce Commission and a partnership with the TAMU Energy Systems Lab, approximately $7,000 in training costs was saved by allowing three city staff members to attend nine workshops. CSU performed 206 on-site energy audits and certified 35 Good Cents homes. Other conservation programs saw 402 rebates offered for the Energy Back II HVAC replacement program, the completion of two lighting retrofit projects by commercial customers, and seven new customers taking advantage of the Sun Source Solar PV Program. The energy conservation programs combined to save our kilowatt load by 1,010.7 kW. Water Services obtained TCEQ approval of a contract with Pebble Creek Country Club to use the city’s treated wastewater effluent for golf course irrigation rather than potable water. Additionally, Public Works and Water Services partnered to make much-needed repairs on the city’s irrigation systems by updating our sprinkler systems to realize better water conservation and savings in utility costs. As this is my first State of the City report, I would like to conclude by expressing how much I enjoy serving this council and this community, and how fortunate I am to call College Station home. This entry was posted on February 4, 2012 by City of College Station. It was filed under City Manager, Public Communications and was tagged with conservation, electric utility, green, Parks and Recreation, public works, state of the city report, sustainability, water.